Yesterday was 8th of March – although the government has tried to stop celebrations of 8 March in some Turkish cities; we, the women of Turkey have decided to go on with our celebrations and protest marches, everywhere in the country. We also prepared a book this year to commemorate March 8th. The book, entitled «Don’t Hurt Me» , is a compilation of violence against women themed stories by 25 of our members. 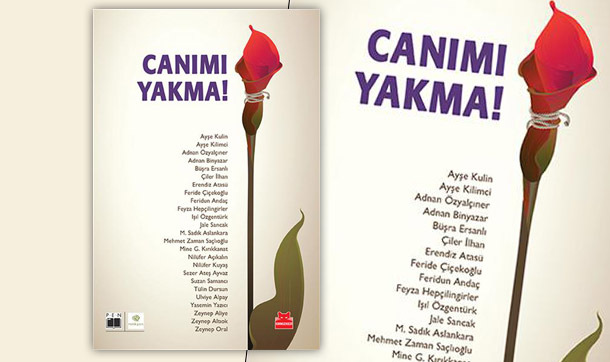 It was published under the generous sponsorship of the Norwegian PEN Centre, by Kirmizi Kedi Publishers. The launch of our book will take place on March 11 as well. And both William Nygaard, president of Norwegian PEN and John Ralston Saul, former President of PEN International, will attend the ceremony . Every year PEN Turkey presents the Duygu Asena Award annually on 8th of March. (Duygu Asena was a feminizt and very popular writer and journalist who died when she was 60, ten years ago) . Since then we give an award in her name to those individuals and / or associations who have contributed to women’s causes, research, and fight for recognition, equality and freedom. This year we are giving the award to the Women’s Library ıof İstanbul. 25 years ago, the Library of Women’s Works & lnformation Center of İstanbul embarked on a journey of imparting information under the motto «no documentation no history». Our past is made of men and women, but history was written only by men, thus only their sories took place in the history, as if women did not exist.. WL created a miracle in these last 25 years. This action comprises not only of the library with its vast archives &. collections but also activities such as research, symposia, panel discussions, verbal history projects both on national & international levels in order to provide a source of interest & flow of information to women from every generation . The Trust thus set a precedent to inspire future generations. The Awards ceremony will take place on Friday March 11 at 19.00 on the premises of the French Cultural centre.